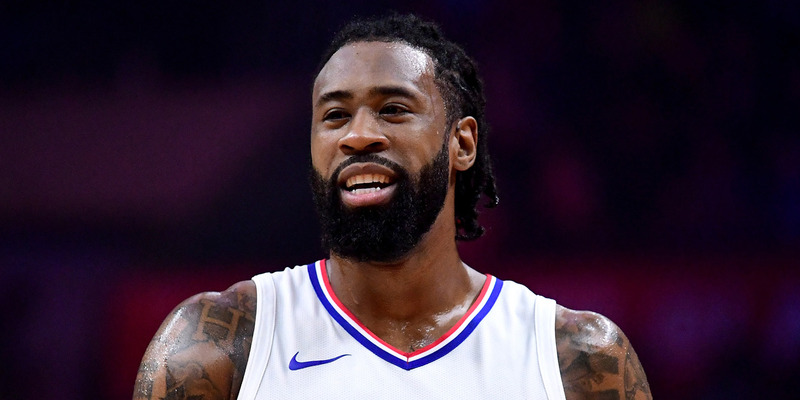 DeAndre Jordan is one of the top players on the trade market, but teams are hesitant to deal for him. According to reports, Jordan is expected to decline a contract option and become a free agent this season, but few teams want to trade for a player who may leave in a few months. Jordan may be wise to opt into that deal because early signs suggest few teams will pay him more than he’d make on his contract option. The NBA trade deadline is on Thursday, and teams appear to have cold feet about pursuing one of the biggest names available. Los Angeles Clippers center DeAndre Jordan has been the subject of trade rumours all season long, but according to several reports, there is hesitancy about making any big commitment to Jordan. Jordan has a $US24 million player option next season that he seems likely to decline to become a free agent. Though the decision isn’t official, Jordan hired an agent this season after going several years without one, a potential sign that he is testing the market. ESPN’s Zach Lowe reported that the Houston Rockets, Milwaukee Bucks, Portland Trail Blazers, and Washington Wizards have all explored the trade market around Jordan. Lowe reported, however, that there would be more interest league-wide if Jordan signalled he would opt into his deal, but there hasn’t been any indication of such. David Aldridge of NBA.com reported something similar, saying that the hiring of an agent suggested Jordan would likely be looking for a new max or near-max contract. However, diving into free agency may be a gamble for Jordan. As ESPN’s Brian Windhorst and Bobby Marks outlined, the cap explosion of 2016 – when teams spent frivolously because of an abundance of new TV money – and the near-flattening of it thereafter, has left very few teams with cap space. Currently, seven teams are expected to have significant cap space this offseason, and several of them are rebuilding teams that may not want to spend big on Jordan. It’s expected to be a tough year to be a free agent. Jordan would be one of the top players available, but it’s unclear if teams will be willing to top the $US24 million per year that he would make next season. Jordan is a very good defensive center, but not an elite one. He’s an elite rebounder and finisher around the basket, but possesses few of the other skills teams around the NBA covet in players – shooting, passing, the ability to manoeuvre off the dribble. These same things make it tough for a team to justify trading a big haul for Jordan. He’s a difference-maker, for sure, but he might not be enough on his own to take a team to contention status. The Cleveland Cavaliers, for example, offered their own first-round pick (not the Brooklyn Nets’ coveted pick) and big contracts they’re trying to dump to the Clippers for Jordan, according to USA Today. The Clippers said no. This is representative of the dilemma on two levels – teams don’t want to spend big on Jordan, especially if there’s no guarantee he sticks around for more than a few months. Jordan may be wise to say he’ll opt into his player option. He may not make more than that option this summer, and if he doesn’t, he may stay on a middling Clippers team until the end of the season.